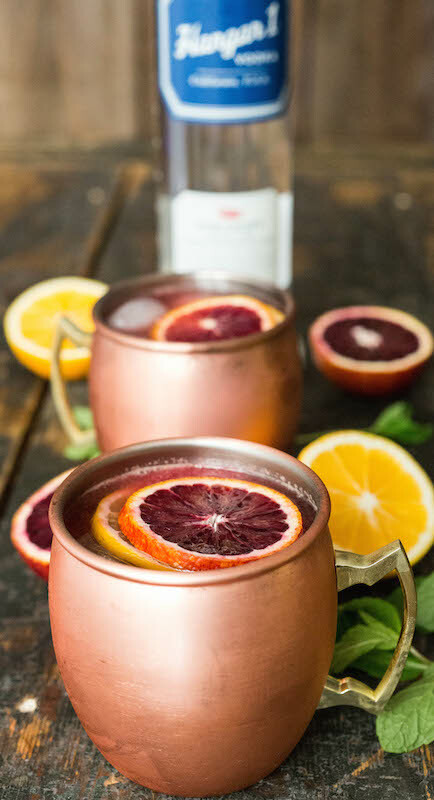 This Moscow Mule recipe is infused with the seasonal flavors of fresh blood oranges and Meyer lemons. This post was made in partnership with Drizly, however, all opinions are my own. Snag the vodka I used from them! My 2017 has been off to a rough start so far. If you are a regular reader of this blog, you may have noticed a severe lack of posts over the past month. Unfortunately, I came down with a nasty kidney infection that had me in and out of the hospital. I am finally fully recovered and am now back in the swing of things. I’ve been operating at 110% every day trying to make a dent in the emails and workload I need to catch up on. But sometimes, you just have to take a step back from all those responsibilities and enjoy happy hour. 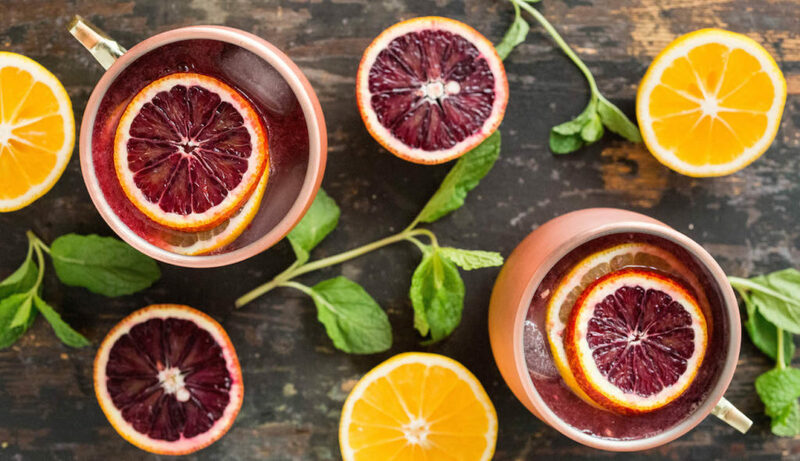 Luckily for me, my favorite citrus fruits are in season and I’m now a “Top Shelf Blogger” for Drizly. This means I can do happy hour and call it work. Perfect! Drizly makes happy hour extra awesome because you don’t even have to leave your house for ingredients! I ordered my favorite vodka, Hangar One, and the ginger beer from them. Half an hour later, they delivered it to my door and I didn’t even have to pause my Netflix! A phenomenal service, if you asked me. I simply juiced the Meyer lemons and blood oranges to incorporate their flavor into my mule. 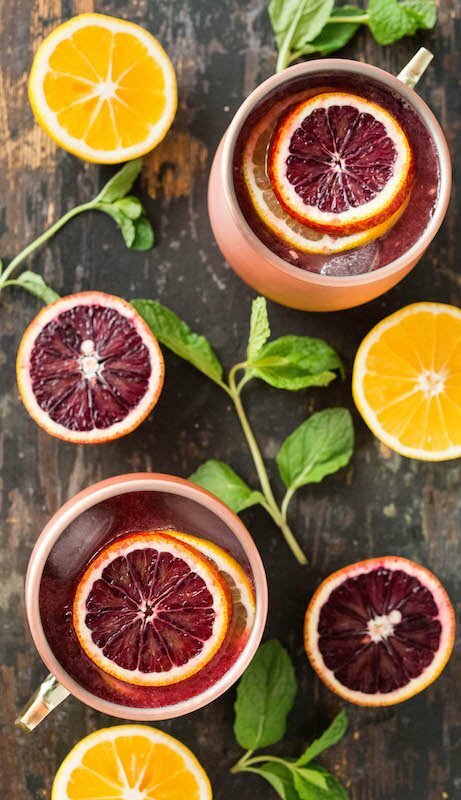 I love the slight tartness the lemon adds while the blood orange adds a lot of flavor and balances it out with it’s added sweetness. Do you make Moscow Mules at home? Have any special twists you put on it? Let me know, ’cause I’ve got these cute little copper cups and I want to put ’em to good use! Feel free to snag your ingredients on Drizly, so you don’t have to put on real clothes or leave the house! Happy hour + sweatpants = the happiest hour ? Slice each piece of citrus in half and juice until you have 1/3 cup of both Meyer lemon and blood orange juice. Take two copper mugs and fill to the top with ice. Add the fruit juice and vodka, evenly distributing between the two mugs. Fill to the top with ginger beer. Garnish with slices of Meyer lemon and blood orange. The pictures are stunning! I wish you good health and I hope you feel better and the rest of the year is great! I love all these variations on the Moscow Mule that are coming out – This one sounds delicious! This is so perfect for this time of year! Now, if only the rain would stop in Seattle, I could get in the mood for one of these. YUM! You are right, Abra. I had one of these without the vodka and it was a seriously tasty beverage! What a great recipe it is. It’s easy and quick to prepare. Will definitely try it some day.